Hi everyone! 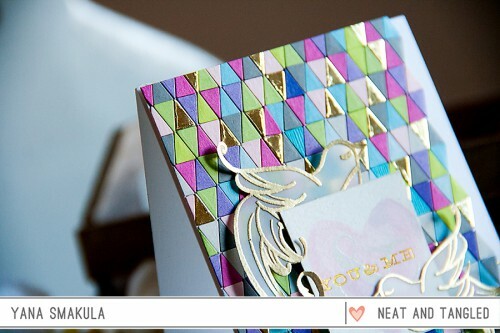 Neat & Tangled and Cosmo Cricket are having a fabulous collaboration this week and I’m dying to share my card with you! I have to say I am a bit intimidated by watercolor, I am always afraid to ruin my project and I try stay away from the actual watercolor paining (I do love making simple watercolor backgrounds, but its just not the same thing). But when I saw the Cosmo Cricket Just Add Watercolor line (if you haven’t seen it yet – check out this video from CHA) – I instantly knew it was “my thing”. Easy and simple! 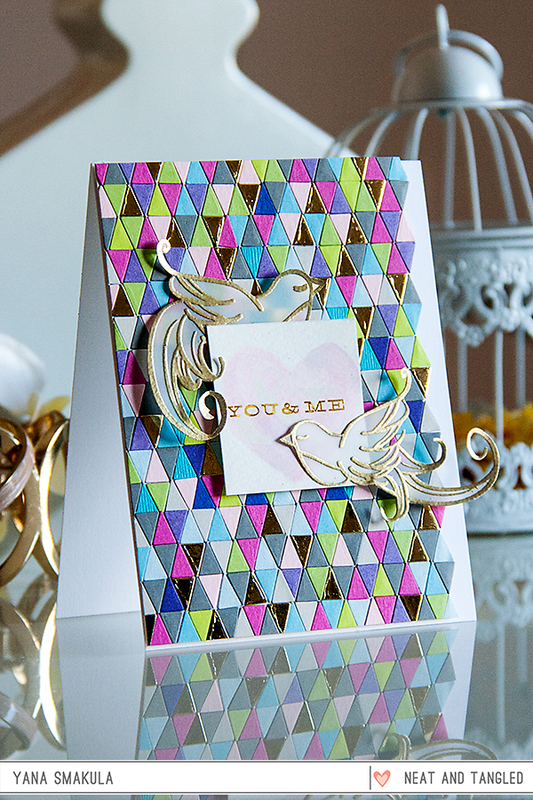 To create this card I started small – I painted a heart on a small resist square and revealed a sentiment. I also created a fun background using the Tiny Triangles die – I used the negative die cut triangles and arranged them into a fun colorful pattern. I also stamped and heat embossed two bird images from the My Heart Sings set on vellum and the cut them out using my scissors. 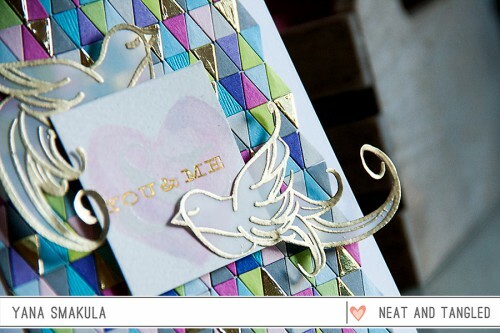 Be sure to stop by the Neat & Tangled blog this weeks, there are lots of gorgeous projects being shared on the blog. Oh my…..what a work you have done. It must have taken quite some time. Its lovly. This card must have taken forever to make but it was so worth it. Beautiful Yana.